It's a birthday card and although there are some stamped flowers on the denim woodgrain I think it works as a birthday card for a guy or a gal. I first drug Adirondack Earthtones STONEWASHED ink pad over Craft cs. I used my heat gun and dried the ink. Then I drug Whisper White ink pad over the Stonewashed. Dried it with the heat gun. Then I inked up my WoodGrain EF with Crumb Cake and placed my cs inside and ran it through my Big Shot. Then I stamped SU Quin-Essential Flower randomly all over the cs. Added a piece of Pumpkin Pie grosgrain ribbon. 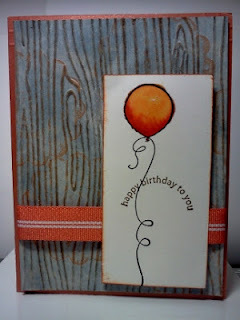 My stamped image is from SU Crazy for Cupcakes. I stamped the image in SU Soft Suede, then I colored with Copics. Voila! Hi Betty, it is so nice to see someone else up this late. After I posted, I notice that the card in the post before the green had disappeared. What a headache that has never happened to me before. I got it back up! I love your card, don't you just love embossing folders? Thanks for stopping by and leaving sweet comments on my blog. Have a wonderful Friday!